French Apple Pie Granola is full of soft apples, raisins, coconut and of course, oats! Call me crazy ,but I love a soft baked granola. The chewiness of the granola reminds me of the delicious chewy granola bars I used to eat as a child. The inspiration for this granola came from our very favorite granola (Raspberry Field Farm) that we used to eat constantly when we were going to college in the Hudson Valley. Their apple pie granola is so unique. It tastes exactly like apple pie and is soft and delicious. You can whip up this granola pretty quickly, especially if you buy dried apple pieces and don't make your own at home like me. We've had so many apples in the house from apple picking season! I've tried to use them every way I can think of! Apple fritters and muffins have been exploding in our house! Of course you can dry your own apples if you wish. Just peel, core, and chop the apples. Place them on a baking sheet and let them dry in a 200 F oven for about 1 1/2 hours. Remove them from the oven, let them cool for a bit and use them in any recipes that call for dried apples! This granola is delicious served on top of yogurt or with milk. It also makes for a quick and delicious anytime snack! Just pop it into your bag and take it to go for breakfast! You can also eat it alongside a glass of apple cider sangria! 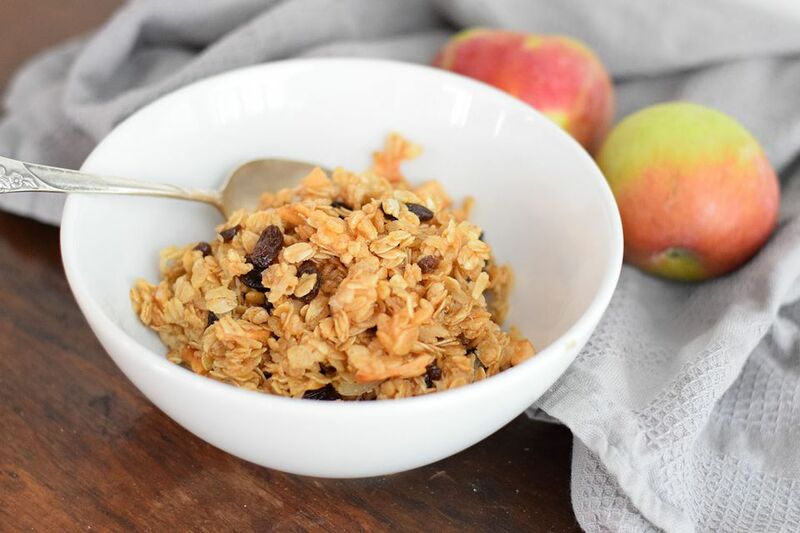 In a large bowl, toss the oats, dried apples, crisp rice cereal, coconut, and raisins. Make sure they are well mixed and the good stuff is dispersed throughout the oats. Add the honey, maple syrup, and butter to a saucepan. Heat on medium for about 5-6 minutes. Stir occasionally with a wooden spoon. It will froth a bit and that is ok. Mix the spices into the honey mixture until they are combined completely. Drizzle the hot honey mixture over the top of the oat mixture and mix with a rubber spatula until the oats are completely coated. Spread the mixture onto a large sheet pan in one thinnish layer. Bake for about 15-20 minutes. Allow the granola to cool and then place in an airtight container.